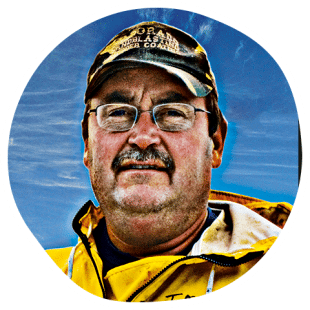 Jack has been a fisherman for 39 years and together with his crew he sails out for days to catch albacore tuna one by one. This is done with a pole and line, which eliminates by-catch. Together with his wife, Jack fights for honest fishing with the American Albacore Fishing Association and received the first MSC certificate for a tuna fishery in the world. Jack loves the sea and his life as a fisherman. He caught his first fish when he was six and now he has been a fisherman for 39 years and a captain for 34 years. Jack fishes from the port in San Diego, in sunny California. Jack and his crew, including Armando, Ramon, Kyle and Chino, are real fishermen. And a part of a larger fleet. They are away from home for a long period of time and they catch every tuna one by one with a pole. They are tied to the boat by a rope around their waste, and stand on the platform for hours, just above the water. After a long time at sea, Jack returns home to his wife Natalie. He then likes to open a can of self-caught tuna. He puts in his fork and eats directly from the can. Preferably with some Mexican Chunky Salsa. This is what makes Jack happy as a fisherman as well. The Latin name for albacore tuna is Thunnus Alalunga. This tuna has an extremely high omega-3 oil content, because this tuna only eats sardines and anchovies. Moreover, the albacore tuna has an extremely low mercury content, therefore a very healthy choice.